Today I wanted to share with you a fun baby shower gift. Of course, I always want to get the mother-to-be a useful gift (maybe off their registry), but I like to get a little creative with it as well. One of my favorites is to make Diaper Babies! Not too hard to make, and they are adorable! Plus, you can make it a little boy or girl diaper baby. 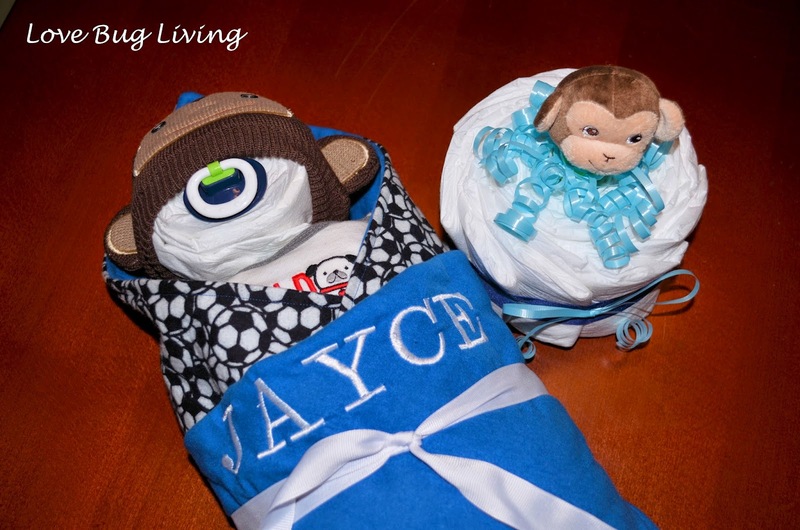 Although it is just as easy to make a gender neutral baby if it is a surprise. 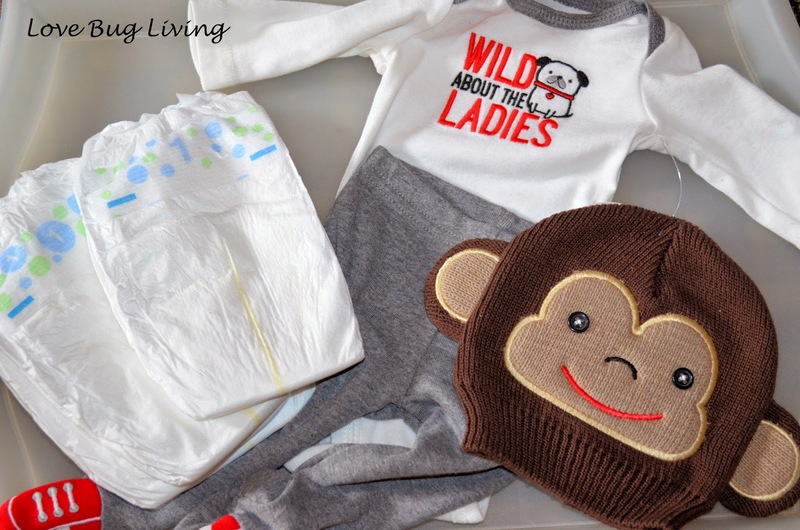 First you will need a pack of size 1 diapers, a baby outfit in a 0-3 month size, a baby hat, and a pacifier. I prefer size 1 diapers and a 3 month outfit since some babies skip right over that newborn size. 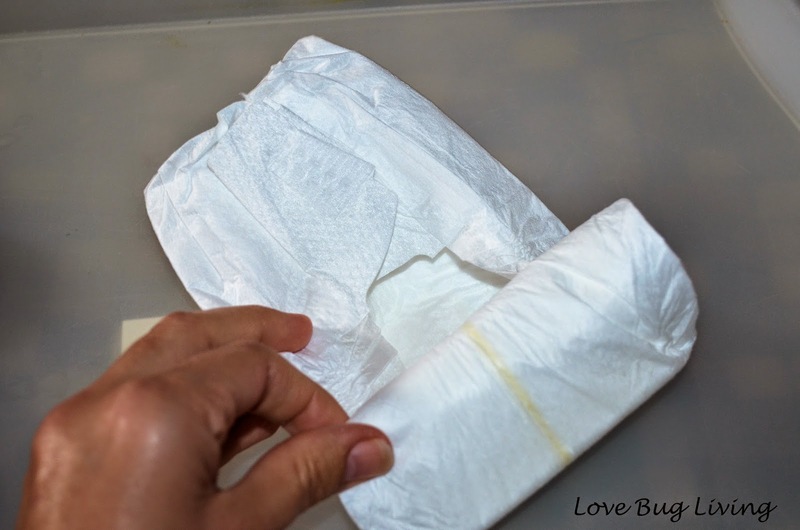 You will start making the baby body by opening a diaper and rolling it up from one side to the other. 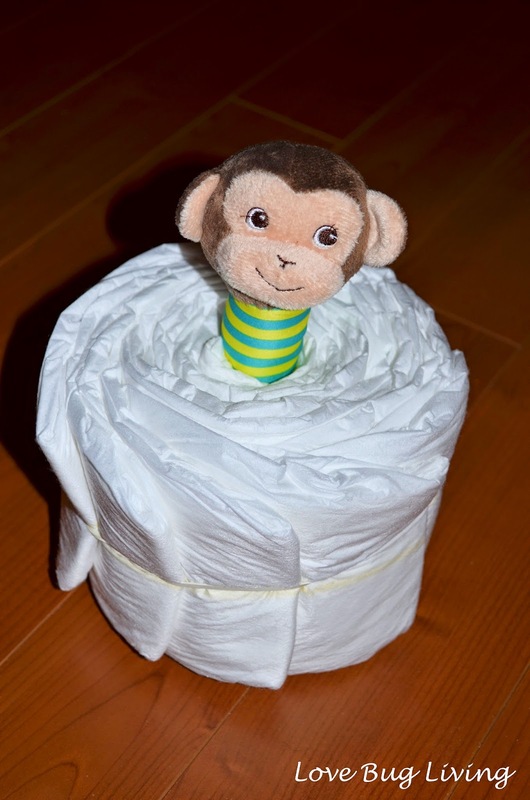 Place this rolled up diaper inside another diaper and continue rolling. 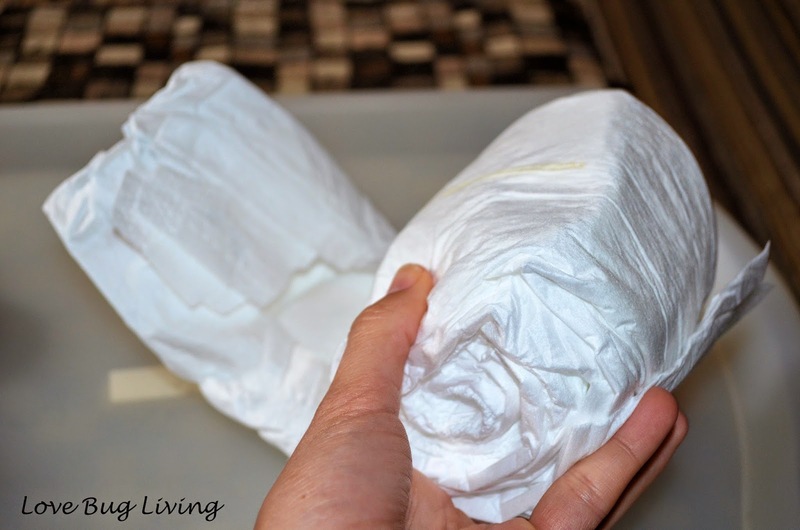 Keep rolling diapers until you get the size you need. 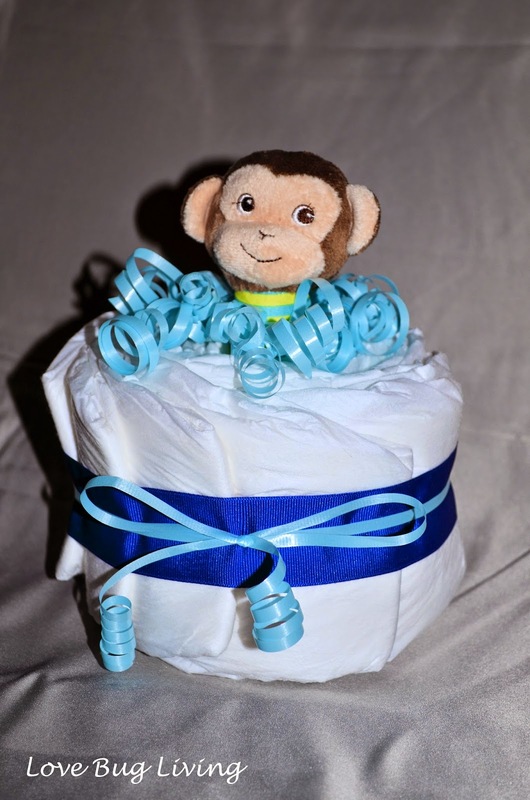 Secure your diaper roll with a large rubber band. 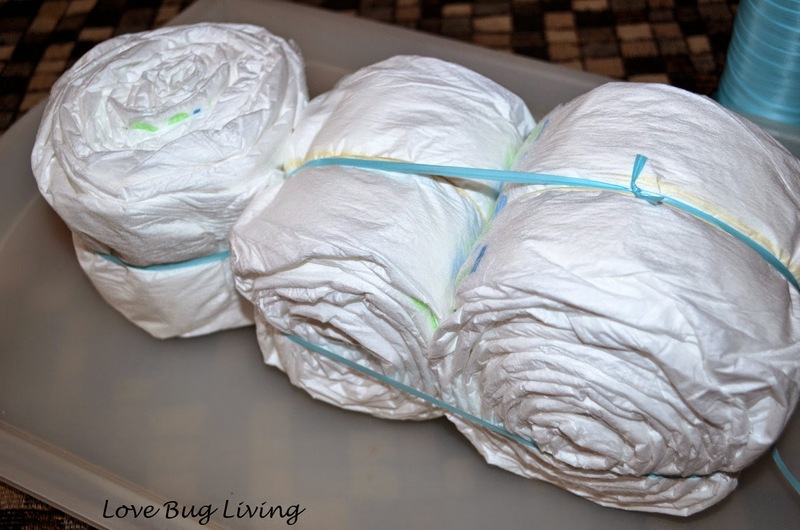 Keep rolling diapers until you have three rolls to create a head, chest and baby body. My chest roll was a bit smaller than the body roll. Now you need to attach these parts together. I used curling ribbon to tie the chest and body rolls together. Wrap your ribbon around the flat sides, basically covering your rubber bands. Take another long piece of your ribbon and tie around the head of your baby. Tie in a knot to secure. Place it the opposite direction of your body rolls. Take your long ends and attach the head to the body by wrapping these ends around the body rolls. It will wrap around the rolled ends (opposite of your other secured ribbon). Tie in a knot. 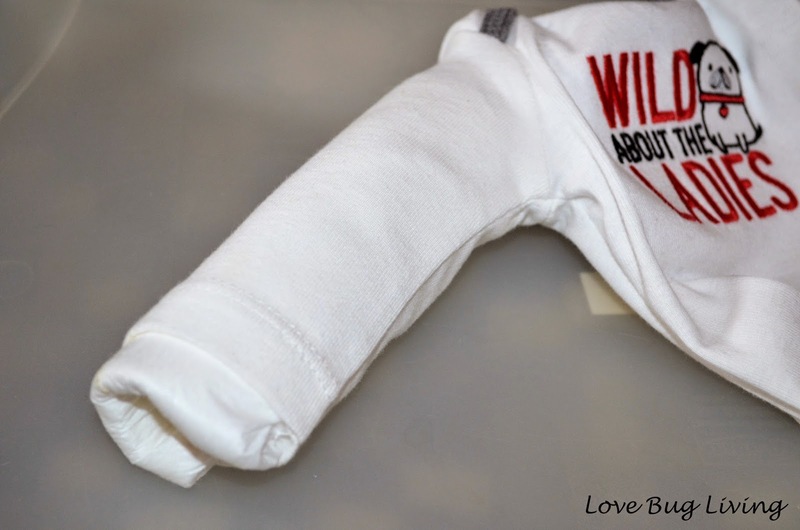 Give your baby arms by rolling a diaper longwise and inserting it into your outfit sleeve. Do the same for the legs of your baby. Now it's time to dress your baby. Be delicate when dressing, but your outfit should actually help secure your baby together. My outfit included built in feet, but you could add socks to your baby if you'd like. Slip a pacifier into the head roll where your baby's mouth would be. You can use a little tape to help secure it if you need to. 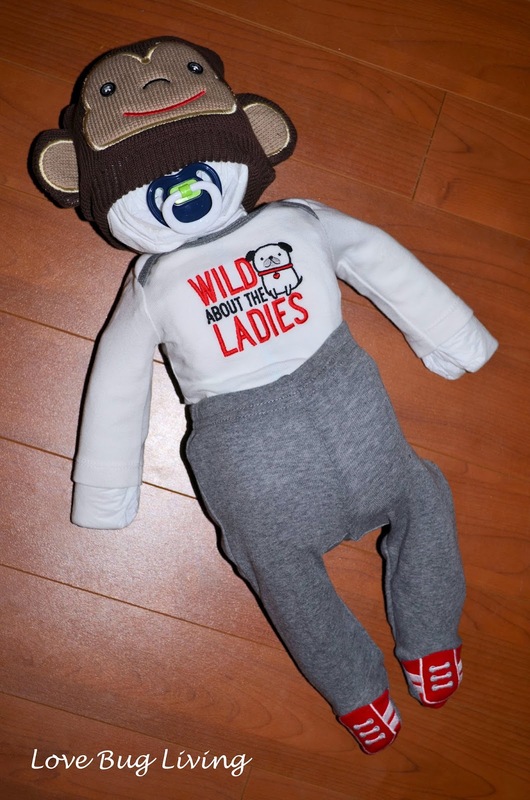 Add your baby's hat and he or she will be ready to cuddle. 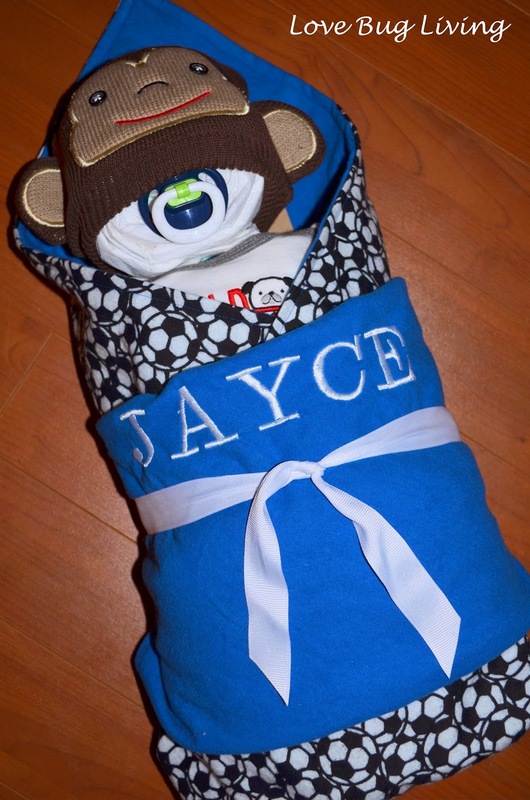 I decided I wanted to swaddle my diaper baby with a personalized flannel blanket. I bought a yard each of solid flannel and a soccer print flannel. I used my Mom's embroidery machine to add the baby's name to the solid. I placed the two pieces, right sides together and sewed all the way around the four sides, leaving an opening. Turn your blanket right sides out. Sew around the four sides again to finish your blanket edge. I love flannel blankets. So easy to make any size, plus there are so many fun prints to choose from. 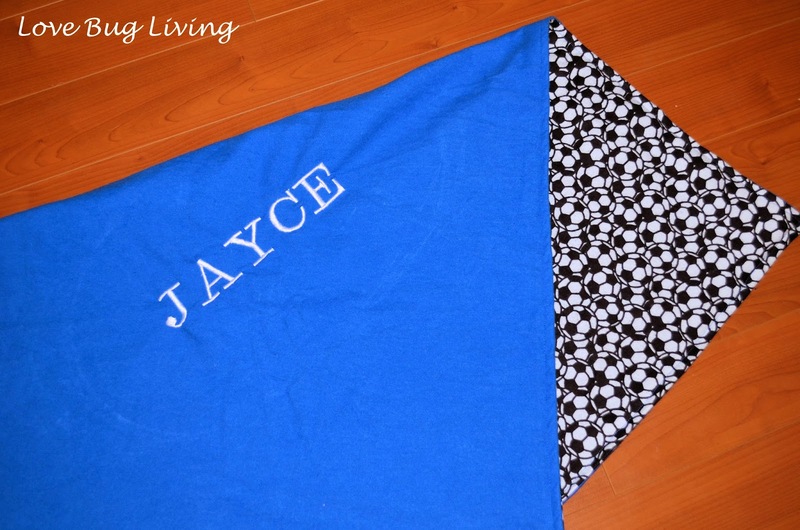 I managed to fold my blanket so that the baby's name was showing as well as the soccer ball print. I used a ribbon to keep the swaddling in place. Here's my love cuddling with our little diaper baby before he went to his new home. I had some leftover diapers that I had no use for, so I wanted to give them to the Mom-to-Be. It's not fun to just hand her a bag of leftovers, so I made them into a Mini Diaper Cake. I used the same rolling technique that I did to make the diaper baby. 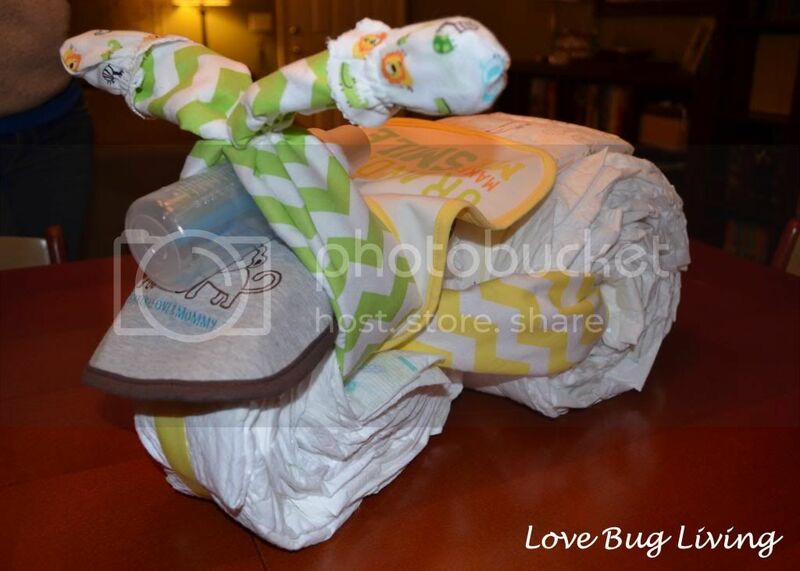 Use up all your leftover diapers and wrap with a rubber band. I stuck a monkey rattle I had found into the middle of my mini cake. Cover your rubber band with a thick ribbon and tape. Add some curling ribbon to keep it in place and a few curls to the top for decoration. These mini cakes make really cute table centerpieces as well. 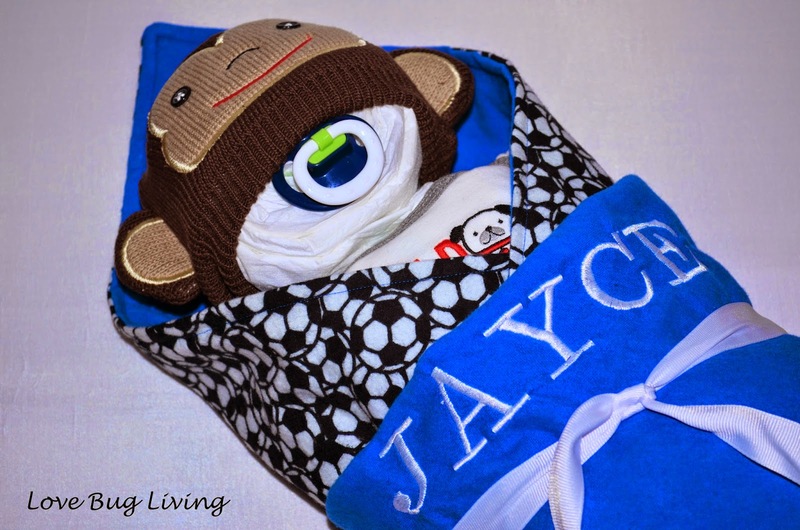 This Diaper Baby and Mini Cake gift is filled with items every new Mom might need. 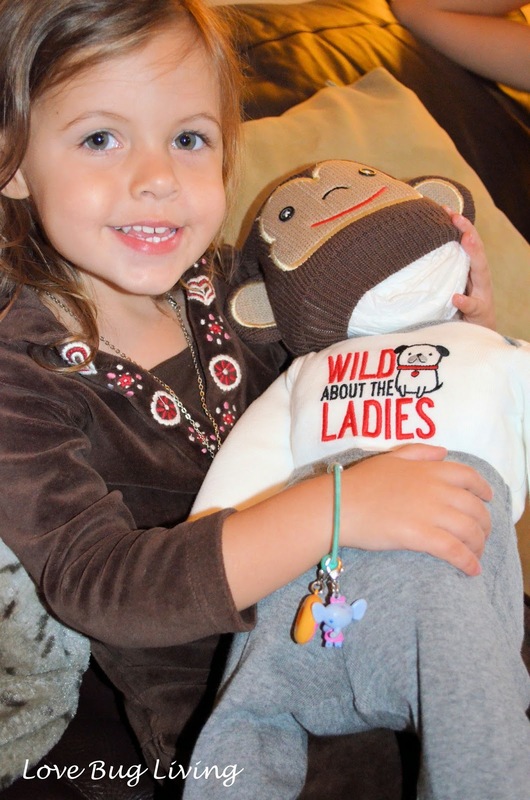 Have fun making the perfect little baby to give the Mom-to-Be you know.